In the unlikely event that fans of chef Marcus Waring stumbled across my blog (Vectors of Prosperity) published yesterday on the Medium platform they might inadvertently imagine that I’d confused fine dining with economic policy – Place three ways! But that accidental analogy (and terrible pun) has some depth. Without care in balancing ingredients, even the most creative cooks will fail to satisfy. Today’s Irish Stew (unlikely contender for the lunch menu in Brussels) was enriched by weekend observations of the strong correlation between the lower half of the Social Mobility Index and votes for Brexit. That distinction between Start-Ups and Scales-Ups is a critical issue. ‘The UK is ranked as third in the world by the Organisation for Economic Cooperation and Development (OECD) for the amount of startups created although sits at thirteenth for scaleups.’ The 2017 annual ScaleUp review once again enters a plea for better metrics – particularly for the benefit of ‘local community developers. As chef Marcus would observe, getting the balance of flavours right requires careful selection of ingredients and experience. The local leaders best placed to succeed are those who recognise the need for learning – which is why the Bloomberg-backed school for mayors (particularly for those transitioning from the National to Local) is more than seasoning. Some notions are so firmly embedded in mainstream minds that they seem impossible to debate. They might once have been classed as ‘truths we hold to be self-evident’, ‘rocks to which we cling’, or ‘life’s firm foundations’. If not learned at our mothers’ knee, some notions are dinned into us through school, college and both corporate and political manifestos. These notions are not just deeply embedded but often, it seems, beyond questioning – sacrosanct. Politics, commonly regarded as the ‘art of the possible’, is more often the graveyard of ‘supposedly impossible’ concepts that may not, should not, WILL not be uttered, or considered. They are thoroughly ‘beyond the pail’ as might once have been said in ring-fenced Dublin. In February, college sophomore Trevor Hill stood up during a televised town hall meeting in New York and posed a simple question to Nancy Pelosi, the leader of the Democrats in the House of Representatives. He cited a study by Harvard University showing that 51% of Americans between the ages of 18 and 29 no longer support the system of capitalism, and asked whether the Democrats could embrace this fast-changing reality and stake out a clearer contrast to right-wing economics. The footage went viral. It was powerful because of the clear contrast it set up. Trevor Hill is no hardened left-winger. He’s just your average millennial—bright, informed, curious about the world, and eager to imagine a better one. But Pelosi, a figurehead of establishment politics, refused to – or was just unable to – entertain his challenge to the status quo. Capitalism aside, the centrality of ‘economic growth’ in most mainstream debate is another sacred cow. It is not just that, in pursuit of growth goals, the way we measure our success is deeply flawed and massively misleading. It’s as if we have collectively forgotten the distance between crude approximations represented by economic models and reality. But even if some can acknowledge the definitional downsides, the centrality of the drive for growth is assumed to be one of those tenets that cannot, should not, WILL not, be shaken – or even lightly stirred. Fortunately, despite the suppressive weight of custom and practice, some economic re-thinkers are, very gradually, gaining greater airtime and setting the myth-takes in their original context. But the show rolls on. Rebellious economists may pour scorn on economic myths. Satirists can stretch popular imaginations to sow seeds of doubt. Cartoonists can seize upon contemporary comedic contradictions. Film-makers and writers can expose deficiencies and ‘events’ can throw a spotlight on issues that have escaped serious attention. But despite all these angry shouts from the sidelines, the players on the field carry on within the established rules of the game. Following years of great effort, two of Kate Raworth’s central themes have shifted towards wider acceptance. Folks may not yet picture a ring doughnut whenever they hear a Treasury Minister, economic correspondent or Bank Governor, speak of economic imperatives, but these speakers do seem (subject to delivery) to have grasped the need for redistributive and regenerative economic policies: Redistributive to tackle gross societal inequalities and Regenerative to avoid trashing the planet. But the 3rd of Kate’s principles still sticks in the throat and, if uttered at all, is in a thin voice as if from the back of the class, hiding from attention. The idea that infinite growth is not central to survival is, for many, problematic. Kate’s approach is not, as the alarmist popular press might presume, a denial of the search for economic growth. Rather, this enlightened economist argues, growth (devoid of objective purpose) should not be central or mandatory. We can, Kate argues, be Growth Agnostic. And in that drawing back from directional determination, we have another touching contrast between Economics (as pseudo science) and the reality of everyday life. For many of us have, sometimes permanently and at other times ephemerally, created our own economic and societal unions – commitments that do not have growth as the central, essential, exclusive objective: ‘for better, for worse, richer or poorer, in sickness and in health’. Whatever. Central government will inevitably continue to depend on the economic approximations of models and metrics that are ill-defined and adrift from reality. That is all they have to go on. They depend on averages, and, on average, their conclusions are pretty average. The UK economy is the aggregate of many diverse local economies each with its very own needs and priorities. If some forms of positive growth occur (whether it’s new ventures or improved citizen wellbeing) they will reflect local activities engendered by investments and creative endeavours within those communities of citizens, businesses and shared services. This will not happen merely because Growth has been mandated from on high. Nor will it happen if (for the bottom-protecting-avoidance of any risk) it is forbidden to engage in local endeavours for which short-term cast-iron profit-certainty is not assured. This is something well understood within far less centralised, more federal, more locally empowered, continental communities. Dogma-driven theorists still know little of locally nuanced needs. Local leaders, on the other hand, are better placed to understand the complex warp and weft of their economic fabrics and societal priorities. Local leaders should be committed, as in marriage, to ‘honour and comfort’ their communities. Set aside the myths. Blow away the fog. Move on from the growth myth-takes of past regimes. The place-making re-enlightenment of local leadership is underway. Localism is the proactive administrative, economic and societal empowerment of places and their people. Across the world it is a force that battles against the natural centralist instincts of national governments. Some societies are comfortable with federal structures that allow degrees of local independence. Others, more centrally directed, are far less tolerant of local deviation. At this time the UK is rapidly discovering that greater localism is a key to future international prosperity. This shift towards stronger, more-empowered, local leadership has many champions across the political spectrum – and they are supported by many public and private actors. Opposing these champions are the massed ranks of established national forces and major utilities. They worry that fragmentation leads to a loss of control, a slide towards fiscal indiscipline and greater complexity. Trust and experience in a common cultural adherence are key issues – defining a sense of identity. But, while the shift has been debated for years as an issue in domestic politics, it is international trade that drives the more recent place-making emphasis. Localism is a global issue. At this time when the UK national government is entangled in disentanglement from the European Union, central policy developers (with their dependence on macro-economic approximations) are painfully aware that their science is largely based on the aggregation of many local economic communities each with diverse needs and priorities. Onto this stage now enter the long-promised metro-mayors and cities emboldened by new concerns for life after Brexit. Add in some fracturing of old political orders and the scene is set for a considered reordering of governmental structure – or possibly opportunistic power plays. At its best Localism is about people and places. The people comprise residents, visitors and commuting employees. Businesses may create jobs, pay local property taxes and have expectations of local infrastructures but their employees, often commuting from far and wide, have no local democratic voice where they work. Heavily dependent on the redistribution of national taxation, Local Authorities are reduced to insignificant branch agencies with occasional competitive battles to adjust some funding formula that rarely reflects local priorities. Some places are sufficiently enlightened to spend public money predominantly with local suppliers – thus investing in greater local money circulation before it is syphoned away to big brands and Treasury coffers. Local levers of power are minimal and this frustrates local leaders whose citizens expect them to promote local economic and social well-being. Woe betide, however, those places that fall markedly below common (nation-wide) expectations and risk outraged complaints of ‘Post-Code Lotteries’ and Daily Mail headlines. Yet we know that some places are more successful that others. Some places seem to attract inward investment in ways that others do not. Some seem able to retain and employ their young people whilst others see only a drift away from home. Some places have a track record in creating new types of employment but others never recover from the demise of old industries. Some seem destined to be losers and never manage to catch the funding streams. But we also know why some fail where others do not. Some attribute the differences to location, weather, historical accidents, insensitive policies or outmoded formulaic funding rules. Some places have been over dependent on outmoded industries and have not seen far enough ahead to plan a different future. But, most of all, the performance variations come down to the quality of locally collaborative leadership. This much was recognised by Lord Heseltine’s Local Enterprise Partnerships – bodies that were, alas, quickly dominated by big-brand placemen – public or private. Fostering collaborative and constructive local leadership takes years – way longer than electoral cycles. And it demands a real understanding of local ecosystems. All that was known and understood way before creation of the European Union. Pre-dating that by several hundred years, cities across northern Europe created the Hanseatic League – a trusted trading network that enabled deep relationships, economic wellbeing and cultural confidence. The Hanseatic League still has echoes in modern times; embedded in an airline name and in the Business Hanse – an active network of enterprises seeking deeper cross border trade. UK cities, mostly facing the North Sea, very clearly understood that confident trading needed much more than a simple market – it demanded trust and whole community support. And building on those formative experiences the ‘new’ place-based strategists can understand why some communities succeed where other decline. This is is why, instead of just puzzling over raw economic data and demographics, successful communities are now being assessed on the deeper quality of local programmes that cut across the top-down sector silos. Creating and sustaining a range of these initiatives requires long-term dedication and a spirit of willing community collaboration – from schools to hospitals, from transport providers to colleges and universities and, vitally, full engagement with really local small business ventures. Hence the recent calls for greater recognition of local business/community responsibilities. All that, of course, would be helped by a central government that saw its role as an enabler, nurturing local differentiation, instead of a state supervisor determined to scold any local experiment that falls a little short of the lowest common denominators of cost-constrained public services. All this we know from the evidence of hundreds of places around the world that have defied expectations and breathed new life into their communities. Building on capabilities that leverage the Smart’ technological enthusiasms of major cities, we are now seeing recognition of a newly empowered breed of ‘Intelligent Communities’. Some achieve this because, simply, “we’ve had enough” and others through inspired local leadership – but, crucially, all are making a name for themselves on the global stage. It’s a puzzle for sure when we have an abundance of ‘fairly average’ national economic data but very little local data granularity to enlighten aspiring city leaders. So when the central ‘industrial strategists’ scratch their heads and our political classes try to imagine how to recover from natural disasters or self-inflicted wounds, this time, we’d hope, the old sectorial orders must be refashioned – supplemented and overlaid with place-based and inclusive, locally-led, economic and societal nutrients. Tolerance and flexibility for their encouragement from the top down will (or should) seek accommodation with local homegrown energies. This article was written as a discussion paper for the Global Summit Steering Group 2018. The Open Call for Nominations for the 2016 Digital Challenge Awards – where more people nominated more projects than ever before – has once again shown the wisdom of not defining the Awards Categories until we can take the measure of those responses. We asked folks to nominate the projects that most impressed and deserved to be celebrated. The online digital world is nothing if not dynamic. Who would have guessed that so much brilliantly creative effort is focused on IT Skills, Health and Digital Inclusion. These are areas where it is fashionable for politicians to bemoan a lack of progress – but in reality they are arenas to celebrated and honoured. The 2016 Trophies will also reflect other trends – like major communities moving on from technological fascinations towards understanding the point that all that creative effort has a direct impact on economic development – yes, even the Augmented Reality History Trail that enriches visitor experiences, boosts the tourism trade, educates local children and enhances local community identity. This is the sixth year for the Digital Challenge Awards programme. Over the years it has produced a wealth of inspiring case studies. The full shortlist for all nine of the 2016 Awards Categories, once again, maps the UK’s digital development. And when we get to the Awards presentation dinner in the House of Lords on October 13th all of the shortlisted finalists will deserve the applause. Very few commentators link Energy and Digital policy topics. Even fewer policy developers understand how they are intertwined. Each policy is on a single track but heading towards each other. Both engines of the economy urgently need collision avoidance. Knocking heads together now can circumvent an even greater mess. Only now are the full consequences of strategic decisions made in separate silos decades ago becoming clear. Attributing blame and short-term attitudes for current and future shortcomings is, alas, too easy. It doesn’t add up to a plan of where we go from here but first there’s a need for everyone to understand that we have a problem. Basically the Internet will not scale – meaning that as demand increases, digital infrastructure performance will suffer and energy supply will become more fragile. Regardless of which growth forecast you believe – and most insiders bet on a doubling of devices over the next decade – without radical overhaul, the predominant current and planned digital access technologies (how you get connected) will consume way too much energy. It is an environmental/sustainability issue that demands a fresh design approach to ensure resilience of these basic utilities. The solutions are twofold – generate vastly more electricity or waste far less of it on inefficient forms of digital connectivity. No one is suggesting that we put the entire economy into hibernation. The first option – generate vastly more – is decidedly unattractive and hugely risky in terms of the UK’s energy supply security. But current efforts to reduce demand need rethinking. The second option – boost connection capacity but at the same time use far less energy – is technologically possible but demands a complete rethink by dominant suppliers – whether they are in fixed line or mobile markets or both. It is simply not possible to envisage future energy sufficiency (Ref 1) to push signals down copper cables or send mobile signals over great distances – like more than 200 metres – given the sort of high frequency spectrum that is now available. All mobile services are themselves ultimately dependent on fixed line connectivity to route to and from the wider Internet. Moreover, the implications of using higher frequency radio spectrum are that the much-vaunted low-power 5G designs will be dependent on fibre connections from millions of locations and will look like Wi-Fi on steroids – with demands way beyond the creaking copper connections of yester-year. How many slightly overlapping 200 metre radius circles fit into the UK’s 65 million acres? That, of course, is a very hypothetical question – we live in a multi-channel landscape – but, as digital applications accelerate, the current lack of any mobile coverage on thousands of miles of UK roads illustrates the challenge. Enthusiasts for maintaining use of legacy copper networks insist on pointing to technologies that seem to increase their capacity (if only in one direction) but these in turn exacerbate the energy challenges. Their application is misplaced. Sure, run fibre all the way to a building and then use the technology to push the signals a little way further inside the building – but even that local in-building distribution is inefficient compared to low power wireless technologies like WiFi. At the same time, Energy Management systems have developed to render past infrastructures obsolescent. The top down view of energy – generators, the national grid, local distribution – is being turned on its head. Alternative energy sources – solar, wind, tidal, wave, ground heat pumps – are popping up all over the place. Soon the complexity of managing demand will be further complicated by new local storage options. One thing that will not help lessen the load is the current and expensively failing UK Smart Meters project. So what if policy developers for both Energy and Digital better understood each other? We don’t need to dwell on the past mistakes – but refocus minds on where they go from here. For around the same investment cost as Smart Meters the Digital camp could reduce Energy demand by between 5-10% – depending on how quickly they buckle down to eliminating copper networks. But, of course, much of that Smart Meter money has already been spent – some would say, wasted. And the net benefit of this silo-fusion? Accelerated economic growth and greater energy supply security – massively faster connectivity and far fewer power failures. If only it was that easy to knock government and industry heads together to avoid an unexpected collision. Maybe, in our newfound love of devolution, city mayors will be resolved to point out that the utility emperors are lacking decent underwear. Back in 2004 Lord Currie (at that time Chairman of the UK’s communications regulator Ofcom) used the term Liquid Bandwidth to describe ‘Bandwidth on Demand’ in 2004. More than a decade later it might actually become reality – though right now only for businesses and in the few households lucky enough to enjoy fully fibred connectivity – FTTP. Whilst examples from other countries are becoming prolific, not many broadband providers in the UK have the technological capacity or the willingness to be so flexible. So CityFibre’s joint-venture with Sky and TalkTalk has got to be good news. One of the many great features enjoyed by fully-fibred communities that we have visited over the years, is their flexibility when it comes to their customer’s changing requirements. It was obvious in Chattanooga as they responded to competition from ADSL and FTTC providers. The FTTH provider can simply flick a switch and increase download & upload speeds immediately – and leave the prices alone. The marginal cost is, well, marginal. The original tariffs allowed customers to choose a level of affordability – and they often chose the FTTH service because they knew that they could get more capacity if/when they ever needed it. Now they also know they will get a better deal every time the network provider needs to be more competitive. And similarly in Sweden – although the example seen there in 2011 was a shift towards ephemeral demand. A ‘standard’ symmetric 100 Mb/s service may simply not be adequate for some event, so why not have a 3-hour boost (at a small premium) to 1 Gb/s? It may be for a sporting occasion, a business convention or just for a gang of teenagers gathering at home for a multi-user games party. But is this dynamic flexibility really needed? Designers of multi-site business networks certainly think so. Not all cities experience extreme seasonal requirements but in Edinburgh many customers of network manager Commsworld are Festival venues that in August require a dramatic increase in bandwidth. By partnering with CityFibre, Commsworld is able to ‘flex’ bandwidth very quickly and, if a customer needs to shift from their normal 10Mb/s service to 10Gb/s for an event, it is not only possible but affordable. The traditional approach to Wide Area Network design demands careful attention to traffic loadings, the geographical dispersion of systems assets and diverse routing for backup in case links are lost. In an uncertain business environment the tendency is to over-provide – to buy more capacity to ensure that future loads can still be met. But what if the enterprise merges with another and the entire network needs to be reconfigured? Sometimes the costs and complexities of systems and network integration will negate the economic logic of mergers and acquisitions. Sometime the delays of new circuit provision will destroy expected competitive advantages. Moreover, this is not just a challenge for enterprises – the same challenges apply in public sector administration, health, education, policing and defence networks – the costs are huge and, many would say, unnecessary in a more fully digitised UK. Some basic ideas are slow to take ahold. 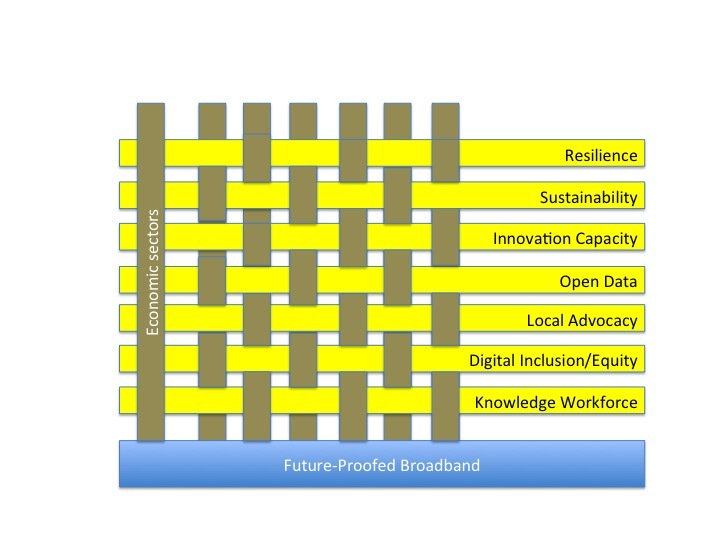 We should give credit to Ofcom’s forward-looking view in 2004 – and ask why it is only a decade and a half later that we realise just how much the inflexibility of old designs has cost our economy both in terms of growth and innovative enablement. So here, for those who perhaps may have missed the 2004 moment (or forgotten it), I append the reported remarks of the then Chairman of Ofcom – made just two years after that organisation’s inception. “ADSL is not true broadband – only a mid-band convenience product” – he says at CMA’s annual conference. Speaking at the 2004 CMA Conference in London, Lord Currie, Chairman of the UK’s communications regulator, Ofcom, urged suppliers to introduce flexible broadband service options – “Liquid bandwidth“. The Ofcom chief also dismissed 512k ADSL as a mid-band “convenience product” that was not “true broadband”. Citing ‘Bandwidth on Demand’ (BoD) services, where users can change their service performance ‘on the fly’ in mid-session to better meet their immediate needs, Lord Currie was also sending a clear signal to suppliers that the era of flat-rate pricing could not be sustained. NextGen 15 the UK’s Trade Show and Workshop event for all engaged in digital infrastructure provision will be held on November 5th in central London – and followed by the NextGen Digital Challenge Awards dinner in the House of Lords. For more details of the event, Keynote speakers, Exhibition opportunities and Delegate registration please visit the NextGen 15 website. With those brave words the Telecoms Regulator in Ireland reported on a pilot project designed to discover just how difficult it is for broadband customers to be sure what it is they are being sold and what performance they can expect. There are, of course, umpteen reasons, excuses, conditions, escape clauses and, for sure, a few honourable exceptions where some customers get almost exactly what it says on the tin. And this was just a limited pilot project – so there’s ample wriggle room around sample sizes, the duration of the exercise, the customers’ own incompetence, the variable load on the system, unreasonable expectations, school holidays and, of course, the weather. What they found was hardly surprising. What they think they can do about it is altogether more difficult. fully-fibred connections beat super-slow copper and fibre/copper combinations hands down. More than that we know that we don’t know enough, but, curiously, most customers have come to expect poor service and only between 19 – 23% would say they were not satisfied. Blessed are they who expected very little. But what’s to be done? Consumers should be able to compare different broadband offers from different providers in order to choose between them – in regulatory-speak, ‘make informed choices’. Apparently we should all learn more about physics so that when we buy rubbish we know we are buying rubbish – even if the adverts suggest otherwise. Contracts should state how bad the service can be – though minimum service levels should not be set so unreasonably low as to provide an easy get-out clause for slack performers. We should have great sympathy for any regulator of a market that specialises in services that are not honestly marketable. We should marvel at such restrained tolerance. Meanwhile, like most comms regulators, the banner of Technology Neutrality is held high. Well it sounds sort of fair, doesn’t it? Surely ‘tis only reasonable to ensure a continuing freedom for connectivity providers to under-deliver in the profitable cause of sweating the assets they inherited from the pre-digital dark ages? In any other sector, governments would intervene in their national interest. Advertising Standards bodies would see red. Trading Inspectors would rule against such local economic blight and outlaw such short-term get-rich fixes. Why do we suffer this tendency of the telephonic tribe to serve up technological cul-de-sacs? Why countenance their demands for subsidies from the public purse? Do they, do we, imagine there is no alternative? But, hey guys, that’s the market hand these regulatory bodies have been dealt. And, if it’s not their job, who now will shift the infrastructure into 21st Century gear?